Orphrey fragment (detail), Late 16th-early 17th century. Italian/Spanish. Silk and linen, 23 7/8 x 8 3/8 inches. 2008.45. This exhibition showcases silk and linen fragments spanning the 15th to 17th centuries, a period of expanded exploration and trade, when Italy and Spain emerged as major centres of textile production. During this era, textiles with three-dimensional effects became popular within the Christian church and the secular world. Cloth and threads were fashioned into elaborate embroidery, gilded three-dimensional images, brilliantly-hued reversible fabrics, and even textiles purposely cut in a pattern that revealed glimpses of one’s undergarments below—a style fashionable during the 17th century. To create relief images, professionally trained embroiderers attached applied work, or appliqués, onto garments, such as orphreys – decorative panels for church vestments. 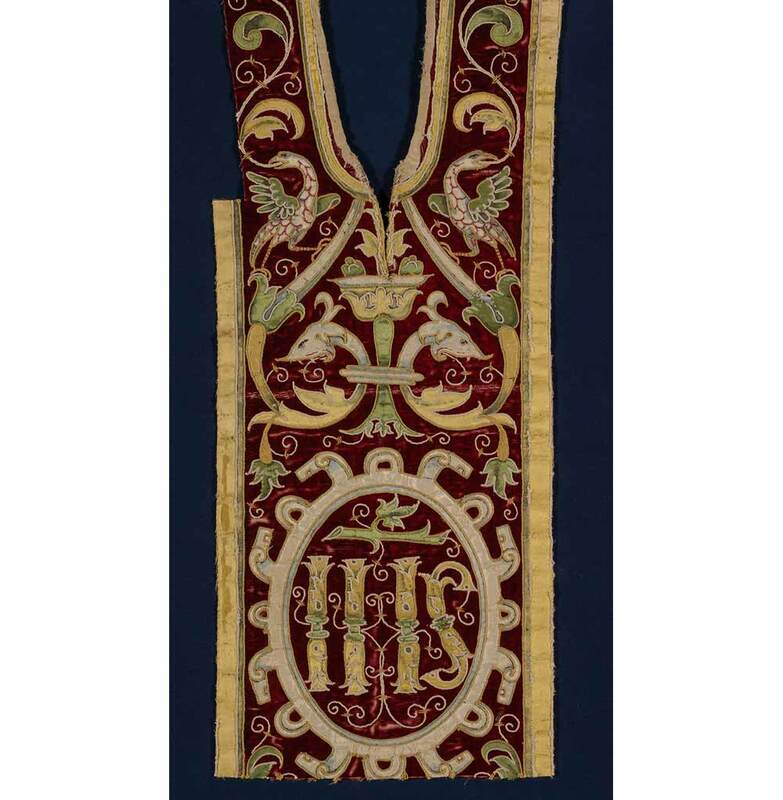 This entry was posted in Exhibition and tagged 15th Century, 16th Century, 17th century, Christian, church vestments, Colour, cut out, hue, Italy, Kansas City, Nelson Atkins Museum, orphreys, panels, reversible, Spain, style, Textiles, thread on March 6, 2019 by costanzabeltrami.